A World War II era bomb dating from 1942 has been lost by Royal navy specialists attempting to destroy it off the south-east coast of England. 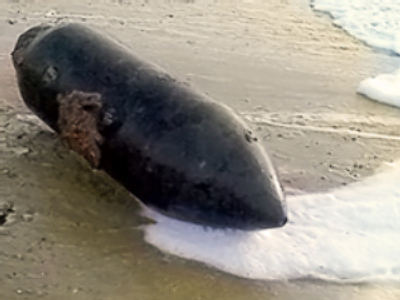 The 1000-pound German SC shell, which has the potential to destroy a large part of the seafront and cause damage up to half a mile inland, first washed up on Felixstowe beach in Suffolk last week. It is thought to be the largest ever to be beached on a British shore. Bomb-disposal experts on Tuesday attempted to tow the shell out to sea for a controlled explosion. Overnight, however, strong currents caused the straps connecting it to the ship to snap and the bomb was lost. A team of Royal Navy divers first scoured a 200-metre area around where the bomb was found. They are now widening their search to a much larger area as they fear it may have drifted a considerable distance.